OTTAWA - The Harper government's commitment of a giant Royal Canadian Air Force transport plane to support French military action in Mali — originally just a one-week assignment — has been extended to a full month. Defence Minister Peter MacKay and Foreign Affairs Minister John Baird said the C-17 Globemaster would continue to ferry military equipment and vehicles between France and the Malian capital of Bamako until Feb. 15. The aircraft won't be part of combat operations, they insisted. "Our government has a strong record of supporting international efforts to combat terrorist activities," MacKay said in the joint statement Thursday. "This Canadian military asset provides France an important strategic lift capacity that enables them to pursue a more stable and secure region." Defence sources say no other aircraft or military support has been earmarked for the campaign. There had been speculation that the government would provide a smaller, C-130J Hercules transport to carry African troops into Mali, where forces are fighting to retake the northern half of the country from al Qaida-linked militants. The French had asked Canada to take on that role, but a number of other nations, including the United States and Britain, have kicked in air transports. 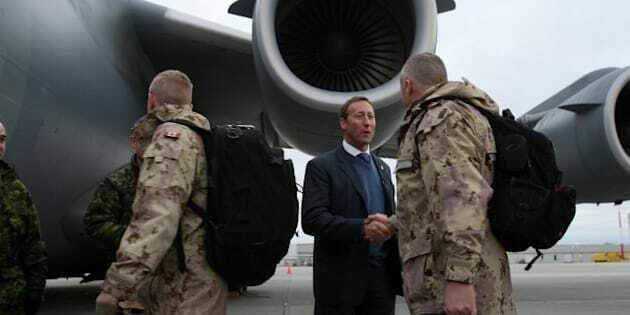 There had been suggestions the French had also asked for other assistance in the form of communications and intelligence support, but MacKay said Thursday he wasn't aware of that. "I know that other countries are looking at what they can contribute to this effort; some European Union countries, others that are looking at providing certain logistics, but this the role that Canada has taken on," he told CBC News. Prime Minister Stephen Harper has ruled out "direct" Canadian military involvement in the campaign, which began on Jan. 10 with the arrival of as many as 2,500 French troops to defend Bamako. However, Harper has consulted opposition parties in order to build a political consensus about whether there should be further support and how that might play out. Baird sought to reassure allies that Canada appreciates fully the danger posed by having a branch of al-Qaida occupying territory and training jihadists in North Africa. "Canada is a committed partner in combating terrorism in all forms," he said in the statement. "We recognize the many challenges Mali and its neighbours are facing at the moment, and we are prepared to do our part for the people of the Sahel." The Harper government has been under pressure from the African Union — and, perhaps more importantly, from countries bordering Mali that are plagued by Islamic insurgencies of their own — to take more decisive military action. Baird said Canada has shown its willingness to help, but he drew a clear line: "Our government also continues to reflect on contributions we can make in other non-military areas." Mali, once one of the most stable democracies in Africa, has spiralled out of control since a group of junior army officers staged a coup in March 2012. That prompted international condemnation and led the Harper government to suspend humanitarian programs. Aid is flowing again, but it is directed through international agencies and non-governmental organizations. "Working with international agencies that have better visibility on the ground is, I think, key to ensuring that the money gets to the people who need it," MacKay said. The chaos that followed the coup allowed three different, loosely allied hard-line Islamic groups — all of them affiliated with al Qaida — to seize the northern half of the country. The interim government in Bamako had been negotiating with some of the rebels when talks broke down in December. That was followed quickly by the United Nations authorizing a 3,300-member African intervention force to oust the guerrillas. Before the force could be assembled, the militants attacked, prompting the French to dispatch its own intervention force. To date, the C-17 has conducted six sustainment flights, carrying 128,000 kilograms of equipment.